Reconnaissance - Uses social engineering to find weaknesses in the target’s security posture. Weaponization - Crafting attack tools for the target system. Delivery - Delivering the attack tools to the target system. Exploit - The malicious file intended for an application target system or the operating system vulnerabilities control objectives is opened by the victim on the target system. Installation - Remote control program installed on the target system. Command & Control - Successfully compromised hosts will create a C2 channel on the Internet to establish a connection with the C2 server. And Actions - After the preceding process, the attacker will continue to steal information about the target system, undermine the integrity and availability of information, and further to control the machine to jump to attack other machines, to expand the sphere of influence. 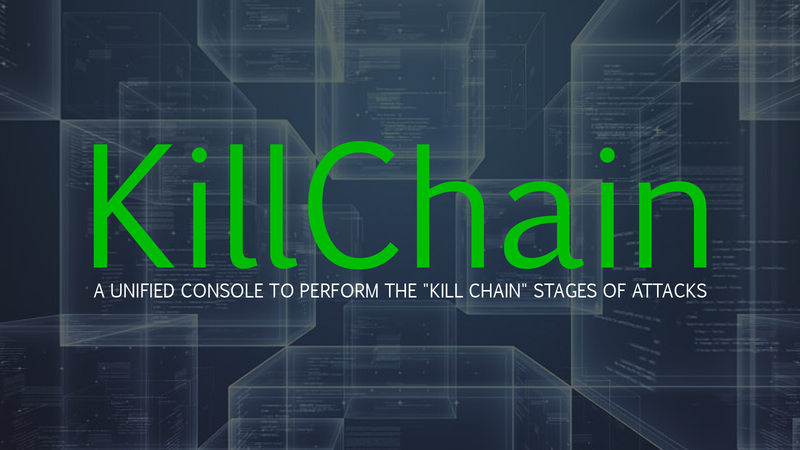 According to Wikipedia, The term kill chain was originally used as a military concept related to the structure of an attack; consisting of target identification, force dispatch to target, decision, order to attack the target, and finally the destruction of the target. Tor -- For the console built-in anonymizer. Set -- Social-Engineer Toolkit (SET), attacks against humans. OpenVas -- Vulnerability scanning and vulnerability management. Veil-Evasion -- Generate metasploit payloads bypass anti-virus. Websploit -- WebSploit Advanced MITM Framework. 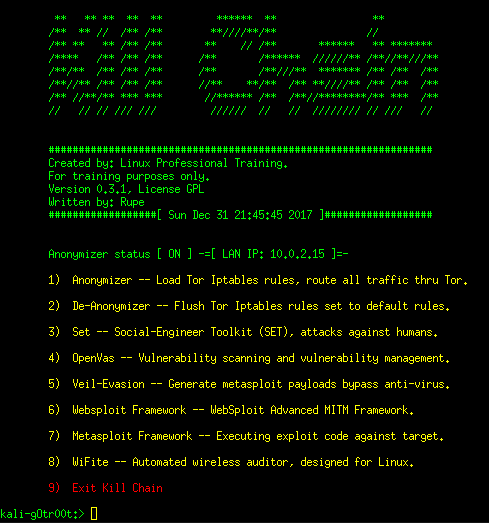 Metasploit -- Executing exploit code against the target. WiFite -- Automated wireless auditor, designed for Linux. Note on Veil-Evasion: Veil will complete the setup upon launch. Accept all the defaults. through. Once it’s complete, it will auto launch. Websploit: To exit websploit, type exit. Metasploit: To exit Metasploit, type exit. WiFite: It's for site survey within the framework of this console. Run wifite in an external terminal to do wireless attacks against the target.